One of my subscribers asked if I could do a video on my paddock/pasture setup for my herd of 5 horses. I live in the Pacific Northwest (Langley, BC) so my setup is designed to keep horses healthy and happy through a LOT of rain and mud. I don’t have a great manure setup on this property – because I’m only boarding here and the residents have a number of parameters I need to abide by. Plus, this property is slated for townhome development in the next few years, so no one is concerned with long-term pasture management here. My manure solution works for now, but is not one I would use on my own land, or as a sustainable solution. Currently, I have dug a pit right behind the barn so we can keep the wheelbarrow on either a gravel or concrete surface all the way to the pile. Otherwise, the barrow would sink into the mud and be immovable. During winter, we only remove manure from the paddock or barn (graveled) surfaces. Last year, at the end of the summer, before the winter rains started, we dug a pit behind the manure pile. This excavator then moved this big pile of manure into the pit and covered it with the earth he dug out of the pit. We left it as a hill because horses love to run and play on hills. 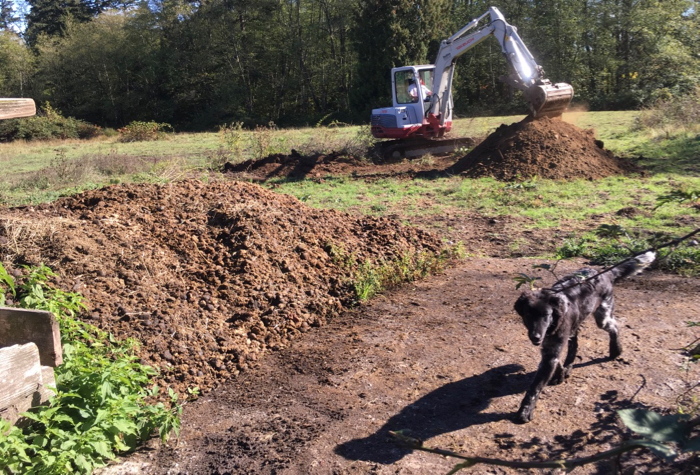 This year, I will have a backhoe come in and carry the manure pile to the back of the property line and dump it into the blackberry bushes and stinging nettle that run along the back fenceline; where the land transitions from meadow to forest. Again, these are make-shift solutions. And while not ideal, they will work until the developers come in, raze everything and put up townhomes and condos. Long-term manure solutions might involve setting up a 3-bin composting system (with 5 horses I’d also need a tractor for that), or dumping into a portable bin that was picked up and taken to a composting facility. Unfortunately, the sun does not get hot enough, nor the winters cold enough to kill the worm eggs in manure in this climate. Nor does our weather break down manure very well. So in the Pacific Northwest or UK climates, it’s all about composting! ← Juno’s 1st Birthday Adventure! Heartbreaking that yet more open land/horse property is being destroying for development. Is there no way to stop the rampant, destructive rezoning of ag and horse lands? At this rate there will be no options for our children to experience the growth, wisdom and maturity that working with these amazing creatures teaches. I hate how something fundamental, wholesome and good, something we care so much about, is being driven from our lives and the lives of future generations by greed (because from what I can see, ‘progress’ or development COULD be stopped and the best things in life protected IF there was the political will. BUT, that means we need mechanisms to fight greed and power in local politics.) Is there anything like a HorseLands Alliance or other org helping to fight all the pavement, new roads, clear cutting of forest and other acts of human sprawl that are destroying rural/horse communities? Well that’s what Agricultural Land Zoning is supposed to do. But the reality is, as the city sprawl gets closer, the developers apply to have the zoning changed and depending on who’s on city council, and whether they accept bribes, or not – they can get the zoning changed to allow for higher density housing. The only solution for horse or nature lovers, is to move further out/away. Those of us with kids who don’t want to leave their school/friends are kind of hooped though. Sadly there is less land, less places to move out to – It’s (sprawl/development) like a paper towel wicking up a spill until it’s all wet and soggy and falling apart. Ah so I think you would need to gather a group in your county – as bylaws and zoning vary by county and State. Maybe see if any local horse organizations are already talking about this? Wonderful to see how it’s all working for you – the horses look so healthy and happy and I’m very envious of your undercover areas. There is one concern I have though – and that’s the metal grates used in the hay feeders. They have been known to cause excessive wear on horse’s front teeth resulting in permanent damage. Have you looked into using netting instead? It works well when tied to a frame that fits inside the hay boxes, and won’t injure your horses. If you get extra thick ply netting, it will stand up to quite a lot of wear and tear, and you can experiment with different sized holes to allow more access or slow them down a bit if need be. I’m still looking for a hay net that my Belgian mare cannot/does not destroy!